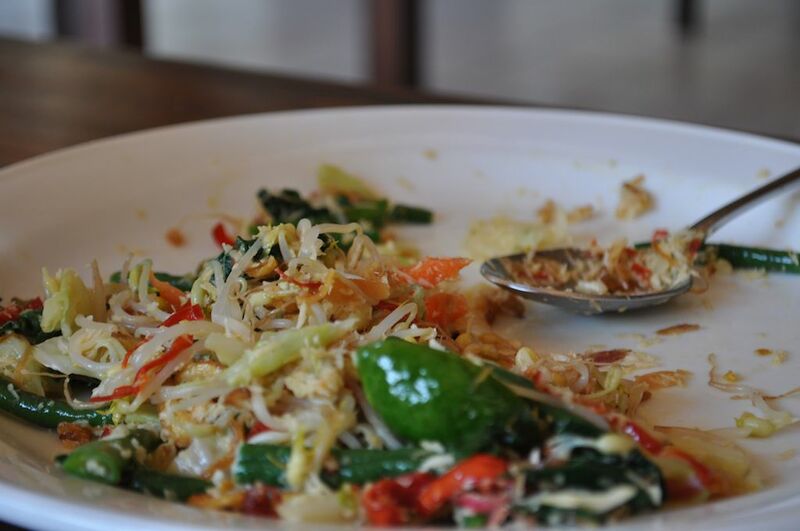 A common misconception of Balinese food is that it’s spicy as in “hot” spicy. On the whole, it’s not. 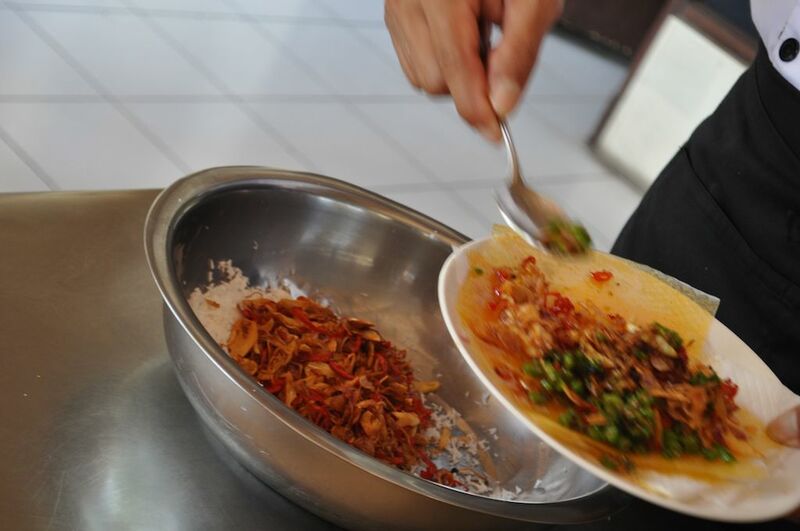 Generally the heat that you get comes from the sambals that are served with it or the base paste, or Basa Gede or “Bumbu”, that’s mixed through it. It’s why the sambals are served on the side of even the simplest of rice dishes- so that you can make things as hot (or as not) as you’d like. 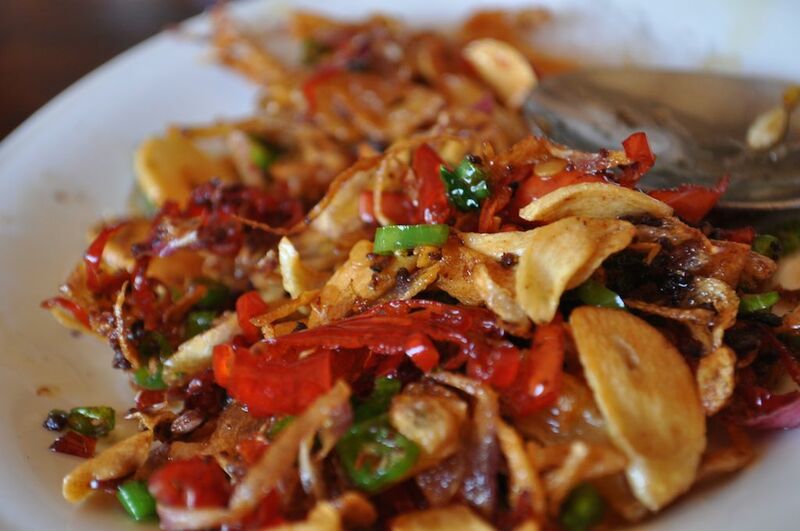 Take this sambal, a Sambal Goreng, or fried sambal, for instance. It goes beautifully as an accompaniment to my favourite mixed vegetable salad (recipe below), but also works well to lift any grilled meat. 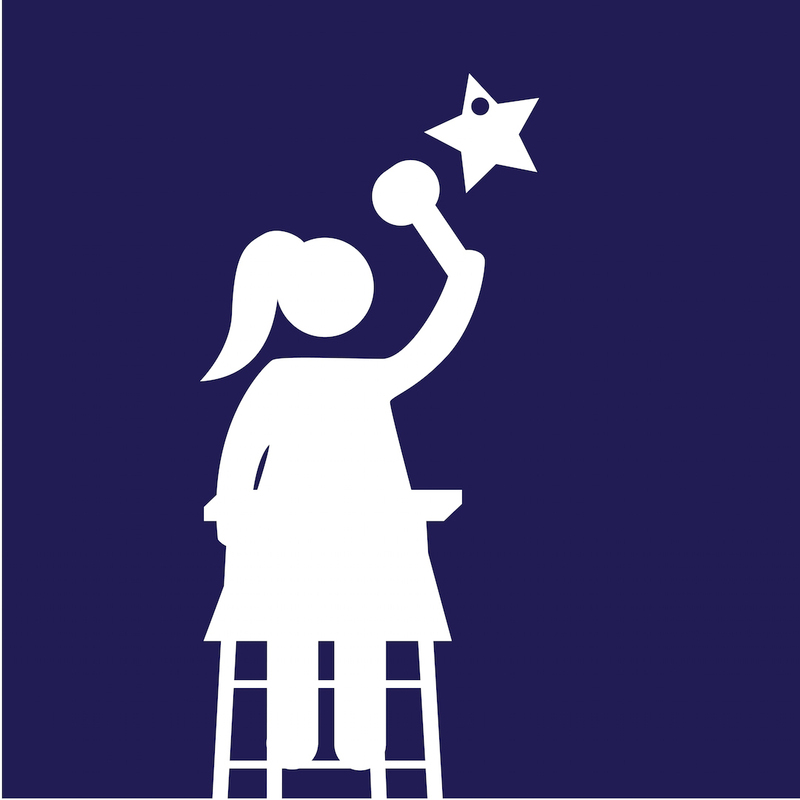 It’s a way of turning something ordinary into something so much more than that. The salad is one that I had more times than I can count last week. It was served with Bebek Goreng (fried duck), Ayam Goreng (fried chicken), grilled fish, as part of a nasi campor, as part of the megibung at Bali Asli. I love it. Sayur is a generic word for vegetables and urab means mix. Mixed vegetables…too easy! Urab more generically is also used to refer to a salad not containing any leaf. 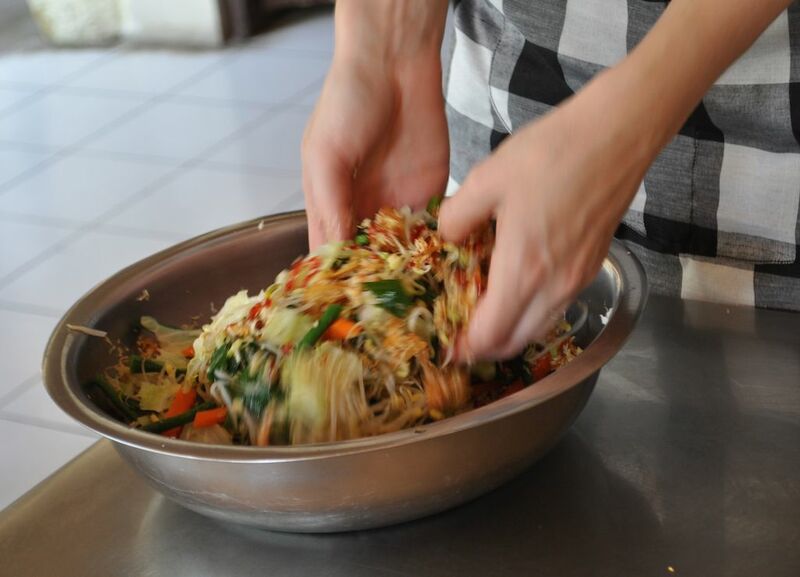 Most Balinese salads are cooked- and often cooked a little more than we normally would. They are, however, usually served lukewarm, or at room temperature. In the chilli world, size really does matter. The smaller the chilli, the hotter the taste. The colour makes a difference too. Red chillis tend to be hotter than green- so red scud chillis (those tiny weapons of mass destruction) will pack more of punch than the long red ones. When it comes to heat, that’s always going to be a matter of personal preference. Contrary to popular belief, the heat is not actually in the seeds, but rather in that white membrane below the skin- so unless you’re prepared to scrape that out with the seeds, you’ll be tasting all that your chilli has to offer. We like it hot, so I use more than the 3 hot chillis specified below, and we don’t de-seed them. What do I mean by shallots? Those tiny reddish onions. They are milder than normal onions, are a bugger to peel and chop, but an absolute must have in Indonesian cooking. Shallots are said to be symbolic of good character, and garlic of bad- so you’ll nearly always see them cooked together…to balance out the good and bad. Here in Australia, it can be tough to source candlenuts. We have a few good Asian grocers around us that we source ours from, but if you have problems getting them, or simply can’t be faffed looking for them, macadamias are a good substitute from a texture viewpoint- although, to me, the taste is more like a cross between a macadamia and brazil. One thing we can’t get here is a differentiation between greater and lesser galangal. You see, not all galangals are the same. Both look like ginger root, but are very different in taste. Lesser galangal appears more like young ginger and has a more concentrated flavour. Sometimes the galangal we buy is technically lesser galangal, sometimes it’s very obviously greater galangal. Either way, it’s sold simply as galangal. Most Balinese recipes will use both. Not that the recipe below calls for galangal, but just saying. If you really can’t find it, substitute ginger. Belacan is a foul smelling shrimp paste that is absolutely essential in Indonesian cooking. It’s made from fermented shrimp and…you don’t really want to know. We buy it in our local supermarket in pre-roasted sealed portions. Trust me, there’s no personal glory involved in roasting your own. Kaffir lime leaves are readily available at most supermarkets. I tend to keep what I pop what I don’t use in a zip lock bag and into the freezer. Kaffir limes themselves, though, are difficult to come by. Substitute with regular lime juice. When it comes to grated coconut, you can use dried if you really can’t get the fresh, but the taste and texture of fresh coconut is so much nicer than the desiccated version that gets stuck at the back of your throat. Just saying. The Balinese use this cool, yet strangely dangerous looking, paddle of wood with tiny metal spikes to grate coconut. I sooooo wanted one, but hubby had doubts about how I’d explain it to Australian Customs. Truly, it’s for culinary use. Fry the shallot in the hot oil. Add the garlic, shrimp paste and red chilli and fry for a few more minutes until the garlic and shallots start to take on a crunchy, golden colour. Fish it all out of the oil and set aside. Now add the green chillis to the pan and cook for a few minutes. Stir the green chillis into the rest of the ingredients and set aside. 250g mixed vegetables. Try long green beans, carrots, spinach, cabbage, bean sprouts, or whatever is in your vegie crisper. Chop the beans and carrots into 5cm lengths- you’ll need to cut your carrots into matchsticks first. Roughly chop the spinach and cabbage. 1 cup fresh grated coconut. 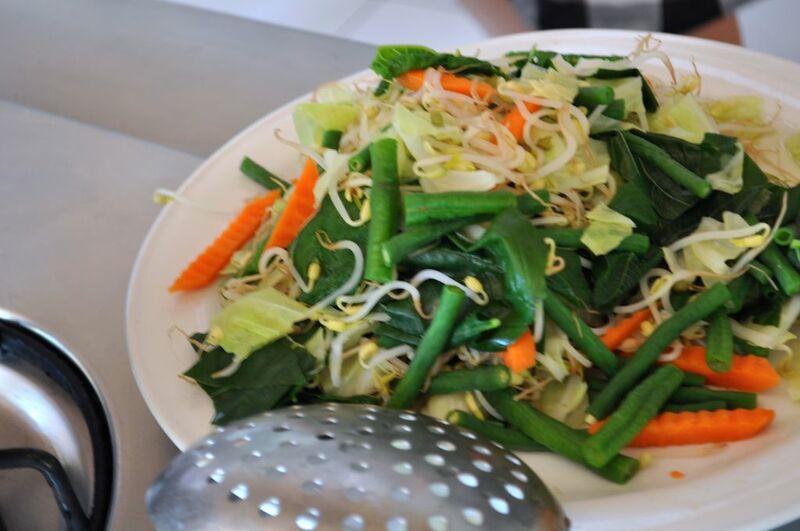 Blanch your vegies for a few minutes- the carrots and beans for a couple of minutes longer than the spinach, cabbage and beansprouts. Drain and set aside. In a large bowl, mix together (best to get your hands into it) the grated coconut, about half of the sambal goreng, lime juice (or lime leaves) and bumbu bali (if you’re using it). Add all the cooked vegies and combine it well. 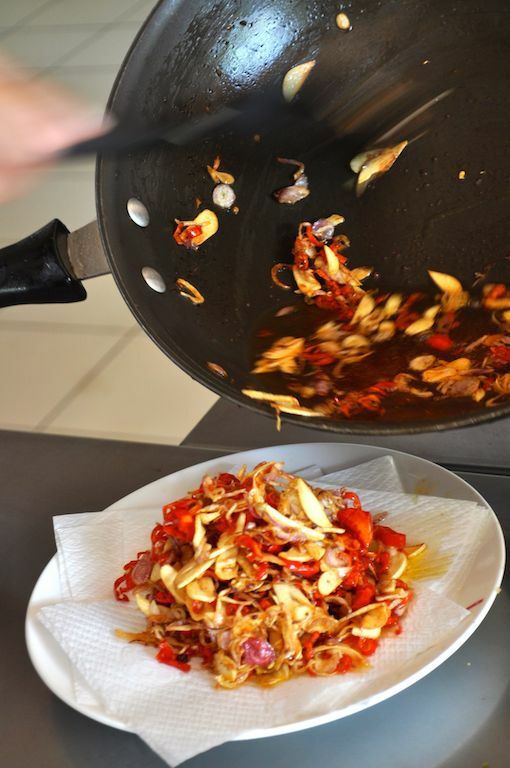 Dollop onto a large plate, and serve with the remainder of the sambal goreng for extra heat. 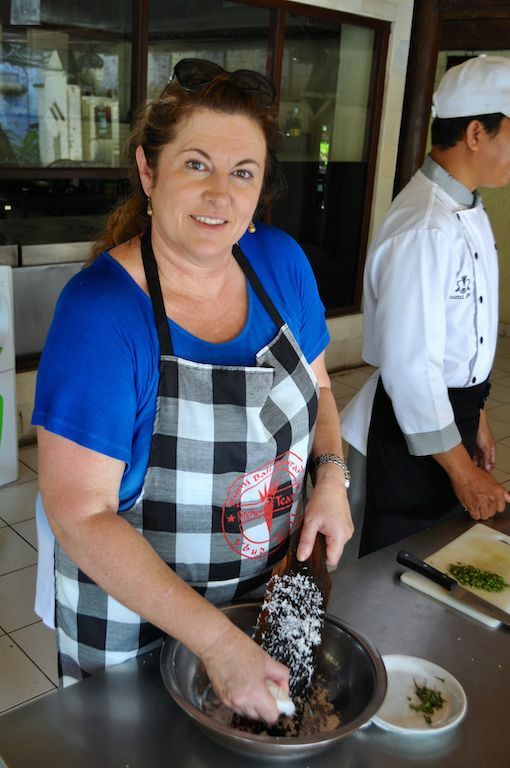 We prepared this in last weeks cooking class at Bumi Bali. The basics of the recipe are courtesy of them, and the photos are also from that class. If you’re ever in Ubud, I can absolutely recommend it!